I may really love Israeli wines, but I am equally passionate about wines from around the world. This past week I was really excited about enjoying some Sherry Fino with sushi! However, what happened next was what I remembered from the last time I tasted this wine – it tasted highly oxidized and really not enjoyable. Sure there were hints of almonds, caramel, and brioche – but the wine was dominated by the ever so obvious veil of oxidation. Actually, forget veil – why not say it for what it was – over oxidized and hard to enjoy. Now, I know what you are all thinking – RIGHT NOW! That is what Sherry is – no? Is Sherry not oxidized? Well yes and no. You see there are many sherries out there, and so before we go on, why not take a trip into our way back machine and talk about the life and times of Sherry in circa 1510 or so. You see way back in the 1500’s, England had entered into an all out war with France and their beloved Bordeaux wines were off-limits. So, Spain seized the opportunity by reducing the tariffs and export taxes on all Spanish wines that were coming into Sanlúcar. In 1517, English merchants were given preferential merchant status-including the right to bear arms in the region. For 80 or so years, life was fine and England natives had their fill with their precious sack or Sherry. You see Sherry is a bastardization by us Anglo folk who have issues with anything other than English. Sherry was anglicized from the Spanish word or Arab word Xeres (Jerez), from where the wine was originated. Sack was another anglicized word, for the Spanish word saca, meaning “extraction” [from the solera process]). But hey this was England and Spain and France did not hold the monopoly on crazy. Sales of Sherry were rising but that started to come to a screaming halt when Henry VIII’s divorced the Spanish princess Catherine of Aragon. This caused backlash by Spain and all English merchants were immediately put under suspicion by Spanish inquisition, causing many of them to run for the their country. To make things worse, in the 1580s, Spain declared war with England, thereby shutting down all lines of commerce. Of course, this was sack were talking about for goodness sake, the nectar from the gods! 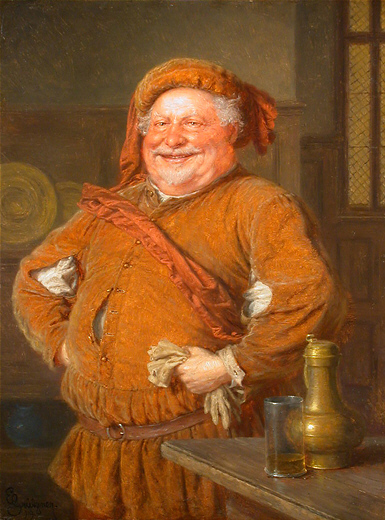 The same golden liquid that drove William Shakespeare to create a fictitious character, called Sir John Falstaff, who most famously noted in Henry IV, Part 2 that “If I had a thousand sons, the first humane principle I would teach them should be, to forswear thin potations and to addict themselves to sack.” Clearly these people had a serious craving for all things “sack”. So, what is an English sea captain to do, one who was recently knighted, when there is a clear and present need – well go and take the bloody stuff! Just because England was a persona non grata, does not mean that all that good sack should go to waste! By the Gods! It was happily sold to South America! So, in 1587 Sir Francis Drake, yes that Drake, who was the second person to circumnavigate the world, from 1577 to 1580. The same man who to the Spaniards was a pain in their side, the man they affectionately called El Draque! 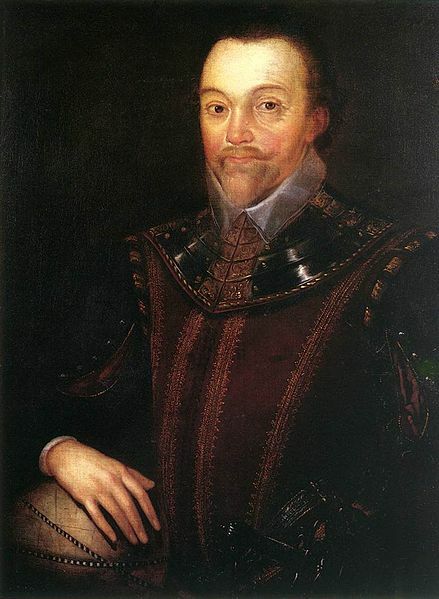 Sir Francis Drake attacked the port of Cadiz, where King Phillip II was building an armada to attack England. Well, Drake went Pearl Harbor on them and destroyed much of the fleet. While he was there, he conveniently captured 2,900 barrels of Sherry that was at the docks waiting to be loaded for ships to South America! However the Sherry in those days were not yet fortified, so the alcohol level on the sherries were far lower. Spain was experimenting with the perfect Sherry grape, and it was not till the turn of the 17th century that Sherry makers discovered that the white chalk albariza soil of the area produced some of the brightest and freshest wines. They also started to understand the magic of the yeast flor. This was the beginning of a wonderful relationship, between Sherry producers and their beloved flor, a natural yeast compound that gave their wines a delicate yet unique and special flavor profile. War is one of those things that change man and place, but they also have effects on history, in ways that are less than obvious. The wars spread across Europe with allies becoming foes overnight, leaving few options for Sherry producers sitting on barrels upon barrels of this Sherry stuff. With few orders coming in, the barrels sat there aging and leaking, and all the while slightly oxidizing and growing nuttier and nuttier by the day. Well, as stocks kept growing and the wine in the barrel was slowly evaporating and thereby oxidizing, there was little the wine makers could do. That is until embodied the great old saying – necessity is the mother of invention. Instead of topping up the barrels with wine from the barrel’s vintage, they started topping the barrels with wine from many vintages. Each and every year, they topped up older barrels with fresh wine from the current vintage. This allowed them to continue to keep their stock of wine alive and in a classic win-win-win situation, they also realized that the flor was refreshed, which than continued to impart new flavors and fragrances. They also realized that by allowing the wine to concentrate and be refreshed in subsequent years that they could keep a more consistent flavor profile in their wines across vintages. So, by now you must be asking, how did that answer any of the issues we have with Sherry. Well that is just what I was getting to! You see, the sherries of old, were oxidized, because that was the desired outcome. The wine was oxidized, in a very port like manner. It was this sweet sherry for which England and many a grandmother around the world grew a sweet tooth! However, as described above, that started to change in the 17th century. It was there that they found the joy of flor. However, before we can get to the joy of flor we must first start with the dullness of Palomino! Please understand, that is in no way an affront to the Palomino, it is a grape of pale color, low in tannin, and one of the most unimaginative favor profiles that exist anywhere! With all of these wonderful accolades, you must be wondering – why are there roughly 70,000 acres of this grape growing in Spain? Well, if you must think of this grape as the ugly duckling or Frankenstein of viticulture! On the vine this grape has a very thin skin, forcing producers to harvest these grapes by hand. To make matters worse, the grape is low in acid, so once the grape is pulled, there is a short period of time before the grape starts to oxidize. Meaning the grape must be picked carefully and then rushed to the crusher, mind you a crusher that is set to a very light maceration of the grape. You see the magic starts right now, but it requires free run juice that is paired with neutral yeast to create what can only be called a bland and uninspiring masterpiece! On an aside, learning how to make sherry would not be the ideal job to get after graduating from a university with a degree in Oenology! Everything about Sherry, from the grape to its maceration to its aging and eventual bottling goes against every rule that one is taught on how to keep wine un-oxidized and desirable! Well, if I have not lost all of you yet, then welcome to the magic of flor. You see the Sherry winemaker wants the uninspiring grape juice that he or she has created. They want a blank slate upon which the science of flor and yeasts can lay their magical touch. Once the wine is fully and bone dry fermented the wine is checked. If the barrel shows fine aromas and flavors, they are lightly fortified with a neutral grape distillate to bring its alcohol content up to around 15%. Now the magic begins. The wine then goes through a process, very much akin to the base wine used in Champagne, except it is 100% different. You see, just like in Champagne the wine is aged in a barrel, but unlike in Champagne, the barrels are filled 4/5 of the way up. This is a sure death knell for most wines, especially wines with low acid! Except we have finally gotten to the magical flor. You see, in the old days, the wine makers used to see this white film on their wines and they marked the barrels diseased! 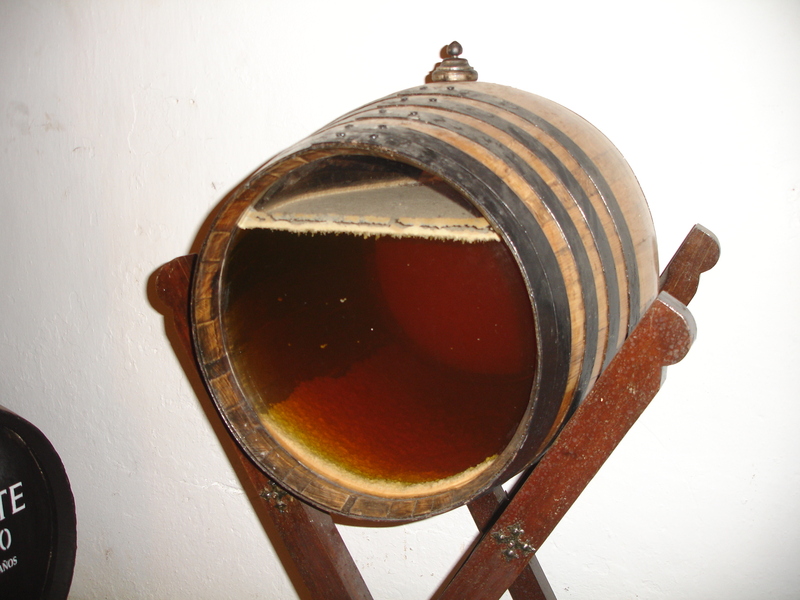 However a few adventurous folk who actually tasted this diseased wine, found the liquid to be fresh and uniquely flavored, in a way that no other place in the world can reproduce – hence the allure of bone dry Sherry. Flor is as picky and finicky as a private-school-educated trust fund teenager! Flor refers to a film of yeast that can grow as thick as 3 to 5 mm thick! The yeast is indigenous to the South of Spain, and grows ONLY under extremely particular conditions. First of all, there must be air space in the barrel for the flor to reproduce. The flor is thick enough to allow the wine below it to age slowly without the worry of oxidation, as the flor acts as a protective barrier or shield from nasty microbial; like oxygen or worse bacteria that would render the wine undrinkable. Of course, in the normal world of wine making, this is accomplished by making sure the barrel is constantly topped up and the bung (barrel cover) essentially touching the wine. Flor likes cooler climates, so the sherries produced in the coastal Sanlúcar de Barrameda and El Puerto de Santa María have a thicker cap of flor than those produced inland in Jerez. The yeast is the magical ingredient that not only acts like a force field, it also flavors the wine below it! The fresh, nutty, bread, and yeast based flavors can all be attributed to the flor! Without having a boring and uninspired base wine, the flor could not exist and Sherry Fino would also be extinct! So, how does this yeast science work? Well, like all yeast it must feed off something. While most yeast feeds off sugar, this yeast strain goes both ways! When the wine is fermenting, the strain consumes all the sugars and turns them into alcohol. Once there is no more sugar to consume and it completes its anaerobic process, the yeast change into an aerobic based yeast! Move over Frankenstein, flor is far more interesting! The yeasts now start breaking down and converting acids into other compounds consuming the wine’s acid and alcohol and all the while turning into a waxy compound that floats on the wine’s surface. Studies have shown that for the flor to survive and thrive, the wine must stay between the narrow alcohol range of 14.5 to 16%. As the wine is depleted of its nutrients and with the natural increase in the wine’s alcohol content, as the water evaporates and the wine concentrates, the wine maker must keep a close eye to make sure the flor is well fed. Since these wines are aged in large old American barrels, for as much as five years, and at least 3 years, the winemaker must be sure to replenish the flor bugs. Over time the flor lose their energy and fall to the floor of the barrel, thereby adding yet more flavor to this magnificent wine. 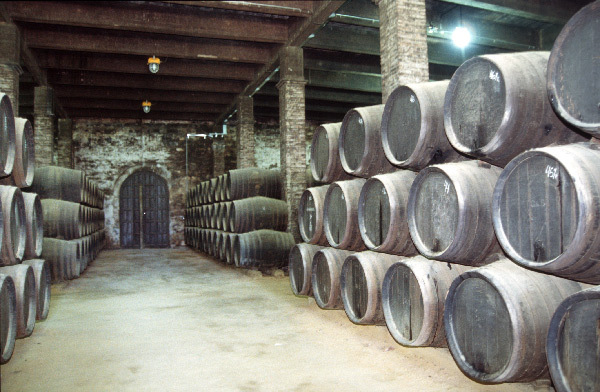 To sustain the flor film sherry winemakers regularly freshen up the wine by adding small amounts of younger base wine. The new fresh wine has the needed nutrients to keep a new generation of flor alive and allows the winemakers to keep the wine consistent throughout the years. Well there you have it! Sherry is a fortified wine that needs its alcohol and acid content to feed a colony of flor yeast to invest the bland and highly uninspired Palomino grape juice with a joie de vivre. However the process of which we just described brings a few things to the forefront. First, all Sherry Fino is non-vintage, which is what sent me on this all out quest to truly understand Sherry wines, but more on that in a bit. Secondly, the process is crazy long and fraught with issues! You are betting the farm on this wine surviving based upon a thin-film of yeast! If those yeast go teenage trust baby crazy – you have an entire winery of oxidized Sherry, which could be used for Oloroso Sherry, but that would not be desired for many reasons. Sherry comes in various styles, from bone dry to very, very sweet. The Sherry Fino is very dry, while the cream nip that is ensconced in the minds of all who hear the word Sherry, is crazy sweet though balanced nicely. Further, the price of Sherry Fino is not commensurate with the crazy effort and risk that these wineries take upon themselves. Look at Champagne, it is far more costly than Sherry Fino and yet it is aged for fewer years than Sherry (15 months for N.V. Champagne). So, is Sherry oxidized? No! Sherry may be reductive in a way, but Sherry never goes through an oxidation process like Port or other solera based wines, that lack the protective layer of flor. Sure, the winemaker can be asleep at the wheel and allow the flor to disintegrate before replenishing it, but then that wine just goes into the sweet wine category, and never sees the fino label. So, the unyielding fear that grip people when they hear the word Sherry, in my opinion, is truly sad. Not one, not two, but a bunch of my friends were shocked to hear about my recent interest in Sherry Fino! When you first take a whiff of the gold colored nectar, it smells a bit oxidized, but that is a misconception and mistake. Unless, of course you do not consume it fresh and young. But wait! I thought we said the wine is non-vintage, so how are we to know if the wine is fresh or old? Great question! That is the very question I sent to Gonzalez Byass, the maker of the world-famous Tio Pepe Sherry Fino. Mind you I said, world-famous for its Sherry production, and it is also the only kosher Sherry that I know of. 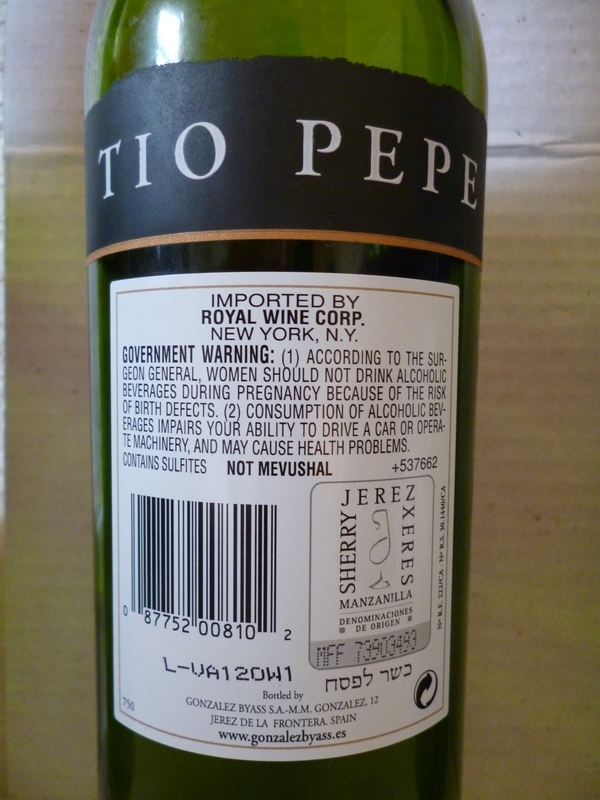 Royal wine produces a kosher Tio Pepe in conjunction with the Tio Pepe winery. So, when I had my poor experience with the previous aforementioned Tio Pepe bottle, they were happy to explain to me that the bottle that I tried was some four years old! How did they know? Well, it turns out that there is a system to the madness! For the non-kosher runs, they simply have a alpha numeric tag on the back of the bottle that denotes the year of production. However, the codes on the back of the kosher bottles were even more complicated, so I do not still understand the code structure, but I do know that the lot code of: YT74OW1 denotes it was produced in 2008. So you ask, what is so bad with that? There are many white wines that can easily age in a bottle for four years! Yes, that is true, but Sherry Fino is made to be consumed in two years at the most. After tha, the wine starts to oxidize and show more creamy and buttery notes, along with somewhat exaggerated notes of nuts and apples. Gone are the scents of ocean, that salty, slimy aroma that one cannot help but smell as they approach a salt based ocean. So, I sent an email over to Gary Landsman, the Director Marketing/PR at Royal Wine Corp. He kindly responded with an emphatic email explaining how he looked into the deal with Tio Pepe, and that indeed they create a run of kosher Tio Pepe once a year! He then kindly and generously offered to send me a bottle of the two latest vintages. I happily accepted as long as I could tell the story on the blog and lay my usual disclaimer about wines which were not bought, but rather donated to the cause! They arrived on Friday and we enjoyed tasting them side-by-side, without knowing which year they were (as I did not check that before the start of Shabbos). Turns out that they were created in 2012 and 2011. The code of L-VA12OW1 means it was bottled in September 2011, and the code of L-XB72OW1 means it was bottled in February of 2012. They paired perfectly with my mushroom risotto! The 2012 vintage was like drinking vinified sea water blended with almond juice, yeast and hay all on a bed of bone dry and tart apple. The dryness of the wine is shocking, almost akin to a Sancerre (French for bone dry Sauvignon Blanc). The 2011 vintage had lost most of the insane salinity and has slid to the more baked goods and butterscotch side of Sherry. Both were lovely but each showed similar characteristics while also showing clearly divergent personalities. I have no real proof to whether this difference could be a result of a truly divergent set of batches or this is the classic evolution of aged Sherry Fino. However, I can tell you that the 2011 vintage is far closer to the 2008 vintage than the 2012. Nowhere in the 2008 vintage will you find sea salt of briny fish liquid. Instead you will find baked almond surprise along with a hint of citrus and fleeting hint of saline, but maybe that is my imagination looking for a connection. In the end, we will have no proof to any real variation unless we tasted these wines as they each progressed from the year of bottling all the way till 4 years later. Personally, what I got out of this experience was a truly honed appreciation for almonds! As I type this I can still smell the almonds from the wine I spat out a few hours ago in the sink. Even my wife commented on the almond and baked goods aromas, that were waffling throughout the room. As explained above, the mention of Sherry brings flashbacks to one’s grandmother or parents sipping a nasty sweet brew that could remove paint from your walls. 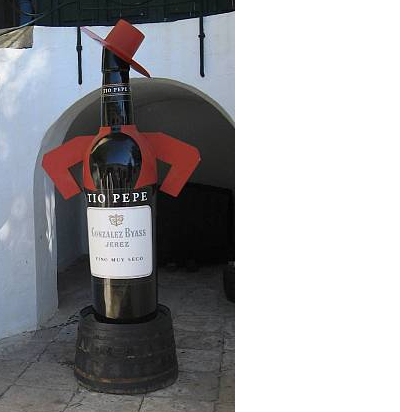 But if you walk into a wine bar, there will always be a request bottle of the best-selling Sherry in the world – the classic green Tio Pepe bottle. 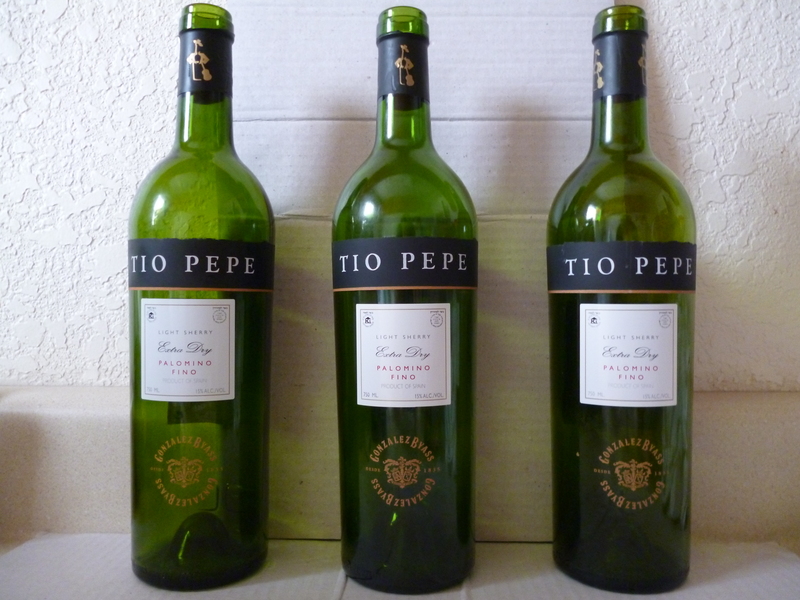 Tio Pepe is produced by Gonzalez Byass, which recently celebrated its 177th anniversary. Located in Jerez de la Frontera, in the south of Spain, Gonzalez Byass expertly produces an extraordinary range of wines from bone dry to lusciously sweet. 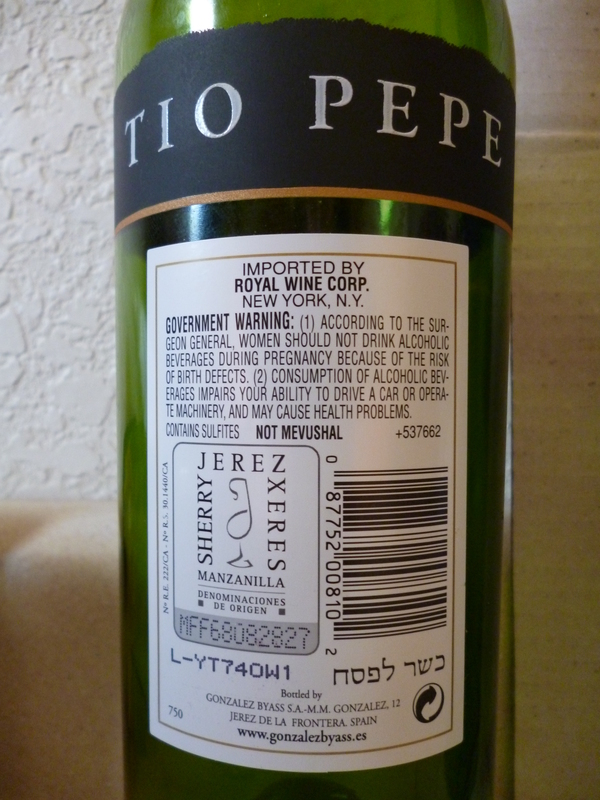 Though the only kosher Sherry, to date, is the Tio Pepe Fino. The members of the Gonzalez family, renowned for their dedication to the world of Viniculture, are also well-known for their love of Nature and the Environment and their support of the Arts and Culture, Science and Sports. The son of the founder, Pedro Nolasco Gonzalez, Marquis of Torresoto, introduced the sport of Polo into Spain and was the founder of the first Sociedad de Tiro de Pichón (Pigeon-Shooting Society) and creator of the first grass tennis court, built within the grounds of the bodega itself. His son, Manuel Maria González Gordon, Marquis of Bonanza, wrote the most important book ever written about the world of Jerez wines. His work, entitled Jerez Xeres Sherry is considered, 70 years after its first publication, the “Bible” of Sherry. Manuel Maria Gonzalez was the first businessman in Spain to install electricity in his Bodegas (Jerez was, together with Haro in La Rioja, the first city in Spain with electric lights) and the first to bring running water to his facilities. He was a key participant in the first railway project in Spain and was instrumental in introducing new industrial techniques and products which were unknown in Spain until that time. First off Sherry Fino is a dry and tart wine, a wine very much akin to a Sancerre. So please do not drink this in an aperitif glass! This is not your grandma’s catnip! Second, the wine is screaming for salty accompaniment – so please enjoy it with fish, cheese, risotto, or salty pasta. Thirdly, Sherry Fino should be served bone chilling cold, much alike a Champagne. Somewhere in the area of 45 degrees Fahrenheit. Fourthly, once you open a bottle of Sherry Fino – Drink it up! This is not a wine that can handle air or being left by itself. Open the bottle and have a few drinks with friends and family and throw out the bottle. Finally, Sherry Fino is meant to be consumed anywhere from 6 months, to at most 18 months from bottling. Any more than that and you are rolling the dice. That is why having your own personal decoding ring for these lot codes is very useful. Gary – could you maybe tell us the code for these lot numbers? Otherwise, I worry you will be asked a lot of questions! So, there you have it. Sherry Fino is a lovely wine that can accompany almost any dish that involves fish, vegetables, cheese, or pasta/rice. It is a truly versatile wine that I think is overlooked to a major degree in the wine world. Recently, Eric Asimov has written two articles on this subject, both about Sherry pairing and Sherry wine itself. I hope you give Sherry Fino a shot. It is a unique flavor and one that truly does grow on you! The wine notes follow below. They are somewhat consistent in style, but their content does differ per vintage. The nose explodes with baskets of fresh lemon and citrus fruit, far fresher and more expressive than the L-VA120W1 vintage, the almonds are not as roasted as much as they are fresh, good yeast, and bushels of freshly dried hay. The mouth is as bone dry as it can get, the flor and palomino grapes play a symphony of oily texture, herb, insane sea water or saline solution, and toast. The finish is bright and tart, with tantalizing hints of butterscotch that linger long on the palate with a final hint of green olives and granny smith apple. This is a wine that is not only bone dry but it has what many would call oxidation. I am sorry, but that is incorrect. The wine did go through the solera method, but the Flor keeps it from becoming oxidized. The method may be reductive, but that does not show as much as the lovely flor reaction does. The palamino grape is vinified till there is not a drop of sugar left and in many ways, not a drop of real flavor either, excepting for the bright lemon and tart notes. The real flavor, texture, and uniqueness of this wine comes from the solera aging method and the flor that adds the nutty and yeasty notes to the wine, along with the barrel aging that adds in the butterscotch and baked goods. The nose explodes with mounds of freshly roasted almonds, lovely lemon zest, freshly baked bread, hints of yeast, and bushels of freshly dried hay. The mouth is as bone dry as it can get, the flor and palomino grapes play a symphony of oily texture, floral notes, herb, nice salinity, and toast. The finish is bright and tart, with tantalizing hints of butterscotch and honey that linger long on the palate with a final hint of baked peach cobbler on a bed of salt. The nose is stunted with oxidation, but is rounded by almond aromas, citrus notes, hints of yeast, and hay. The mouth is as bone dry as it can get, the flor and palomino grapes play a symphony of oily texture, zesty flavors, and toast. The finish is long, with gobs of butterscotch and honey that linger long on the palate and a hint of salt. Clearly the age on this wine has stunted its true value, that being the lovely tartness, saline style, and rich citrus and summer fruit that come with a fresh and young bottle of Sherry fino. This one being some 4 years old has stayed surprisingly spry for its age, but one that cannot hide from the effect of father time. 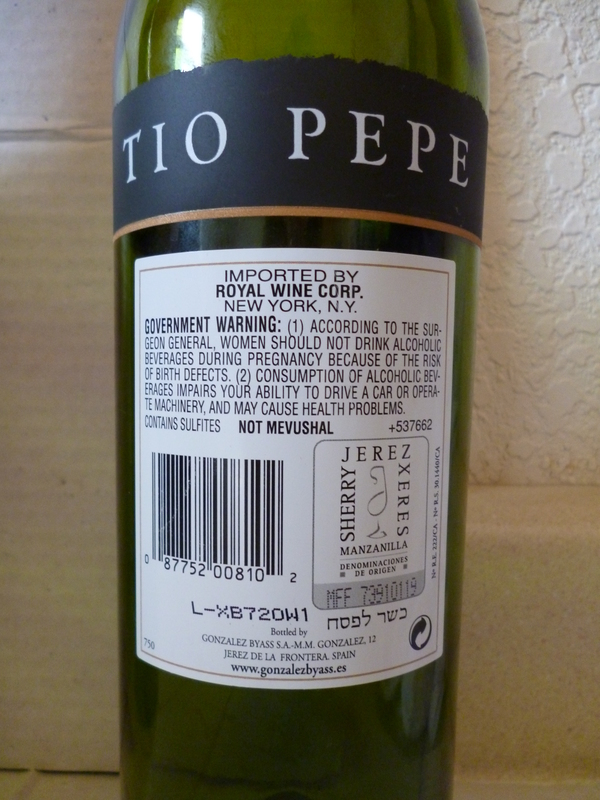 Posted on June 28, 2012, in Kosher White Wine, Wine, Wine Tasting and tagged Fino, Sherry, Tio Pepe. Bookmark the permalink. 1 Comment.